O'Keefe and Manley. Photo by Patrick Bradley. Already balancing academics and responsibilities on the soccer field, Megan O’Keefe couldn’t imagine adding more to her plate when she heard about the Student-Athlete Leadership Development Program. In the end, however, the sophomore came out of the five-week program with a new perspective on herself and her responsibilities. Although the program is a Patriot League-wide initiative, the Academic Support & Access Center’s Ashley Rozendaal designed and tailored its own approach to fit AU students’ needs. Rozendaal uses the DiSC personality profile test to show students how their character traits translate to succeeding in various types of leadership roles. 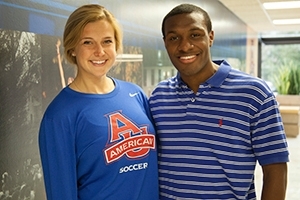 Men’s soccer team captain Jordan Manley completed the program two years ago, but the experience has stuck with him. In fact, he now consistently keeps emotional intelligence in mind when dealing with teammates and class project partners alike. Aside from the curriculum learning, O’Keefe appreciates how the weekly class-style sessions bring together athletes from wrestling and swimming to volleyball and field hockey. That way, she says, she gets to see how different teams often share the same experiences. For Rozendaal, the program complements all the other pieces her office offers to support student-athletes. Freshmen participate in Thinking and Learning Opportunities for New Student-Athletes (or TALONS), which introduces students to resources like the Counseling and Wellness Centers. Juniors and seniors receive comprehensive career training. A former collegiate hammer and discus thrower, Rozendaal understands the need for such diverse, practical programming. For O’Keefe and Manley, the Academic Support & Access Center outpost in Athletics frequently serves as a place of assistance and Rozendaal as a consummate source of guidance. Just as the leadership program showed O’Keefe new things about herself and her responsibilities, Rozendaal has revealed the value athletic achievements when working with Manley on his professional resume. “She really helped me find my own strengths when I didn’t really see benefits in something I did,” Manley said. Whether in programming or one-on-one counseling, Rozendaal and her office will continue overturning student expectations of what they can achieve. It’s what makes her leadership development program uniquely AU.